This is a tale of frustration, amazement and jaw dropping ineptitude. And, thanks to Harvey Norman in Devonport, Tasmania it is a true story. My laptop crashed. Well, really it is Flexirent's laptop... I am just looking after it and paying for the privaledge. So, Flexirent's laptop crashed. I purchased the laptop from Harvey Norman in Burnie, Tasmania nearly two years ago. Because Flexirent takes out the extended waranty, i knew that I should take it to the nearest Harvey Norman store. 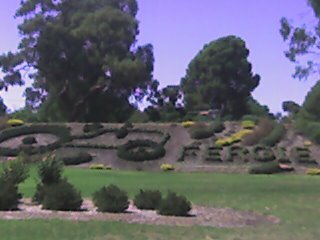 I was working in Devonport for that week, so I took it to the Devonport store. They took my laptop, my phone number and address. I explained that I was in the process of moving from Tasmania to Victoria and would have a new address by the time the laptop was finished, so, "Call my mobile when the laptop is fixed and I will give you the address." The nice sales assistant assured me that would be the case. He also said that it would be 3-5 weeks. Three weeks later I was sitting at my new office desk in Victoria and decided to check on the status of my laptop. After the usual bouncing from person to peson on the phone I was told by the tech guy, "Your laptop has been sitting here for a couple weeks. It's fixed. We just didn't know where to send it." I explained the agreement that the sales assistant had made with me regarding my mobile number and their promise to call it upon completion of their task. The tech guy said, "Oh, well, I don't have your number. Must be the other tech guy who has it." Evidently they do not communicate—at least more than once every couple of weeks. So, I gave my address to the tech guy and my phone number—again. He assured me the laptop would be send out "tomorrow" and it would take about 5 days. I thanked him. That was Thursday morning at 10am. Why he couldn't send it in the remaining seven hours of that business day, I am not sure. But, I was comforted to know that it was fixed and on it's way to me. I also asked this tech guy if they were able to save the data on the harddrive or if they had formatted it. I was thrilled when he said, "Nope. Everything is still there. All fixed!" The next Thursday (that's 7 days, not 5) I decided I better call them again. After the bounce around I got to the tech guy. This time it was the "other" tech guy. He had a very interesting response to my inquiry about my laptop. He said, "Your laptop has been sitting here for a couple weeks. It's fixed. We just didn't know where to send it." (if that seems like a cut-n-paste it's because it is...) I said, "That's what the tech guy said last week! I have him my address! He said he would send it the next day." His response was beautiful, "Oh, you must have talked to the other tech guy, it wasn't me." Evidently I was supposed to see the logic and brilliance in this response and offer words of affirmation and understanding. I did not. I repeated my address in a calm voice, asked when I could expect the laptop and hung up. Then I called back and asked for the manager. When the bounce around got me to the manager (I got to talk to a nice young lady in "computing" first and asked her—again—for a manager. She cheerfully said, "no promlem!" and transfered me.) When I had the manager on the phone he said he had just heard about the problem and that the laptop would be sent that day. I thanked him and then said, "Can I tell you a story?" What could he say? I guess he had other options, but he graciously said, "Sure, go ahead." I then told him the above story of ineptitude. He had not been aware of the whole story (amazing, eh?) as tech guy 1 and 2 had not fully informed him. I then told the manager, "Look, I have a wedding that I am officiating at on Sunday. Based on the promise from the tech guy last week I assured them that my laptop would be available for their slideshow. They are country people and do not have another option. I need my laptop before Sunday." Amazingly, he promised that he would see that the tech guy made it happen. I received a phone call from tech guy 2 about 30 minutes later asking, "Would Saturday morning at 10am be good?" I didn't want to completely confuse the guy by saying, "No, I'll be at church on Saturday morning." So, I said, "That will be fine." He then said, "It's going to cost $240 to have it couriered to you—but don't worry, we will pay—it was our stuff up." Indeed. A few minutes later he called back to say that the delivery was paid and promised. I thanked him and then I said, "You know, for $240 you could fly over, deliver the laptop and spend a day in Melbourne!" His answer helped me to understand the whole frustrating situation, "I thought of that meself and I reckon I would if I weren't 'fraid of flying!" So, there ya go. I have to say, I spent two years living in Tassie and this situation needs to be explained clearly. This guy was not a typical Tasmanian. But, he was (and most likely still is) a typical Harvey Norman employee. Oh, you want to know if I got my laptop, don't you. Yes, it did arrive. And the Harddrive had been wiped clean and blessed with a fresh install of Windows XP with no drivers for the laptop. Had I known the install CD's were needed I would have brought them home from work on Friday. (Why did I believe tech guy 1 about the recovery of my harddrive? Good question!) So, I spent the next few hours downloading and installing drivers so that the wedding (which had a practice 7pm that night—a four hour drive away) would have the promised slideshow. My family arrived home from church. I had a quick bite to eat with them and then I packed up the laptop and headed off to a wedding practice. Which went well, by the way! Apparently, if you ask nicely, you can get nuclear reactors from the American government if you promise to be nice. 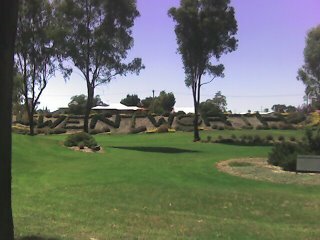 Just past Mildura a town named Wentworth has formed due to the natural phenomenon that occurs there. 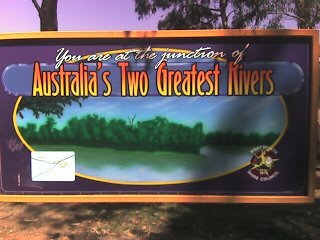 The Darling and the Murray rivers merge - it's quite a sight! There is also another phenomenon that has occurred as a result of the human presence. The bushes spell things. Smart bushes. Smart people. 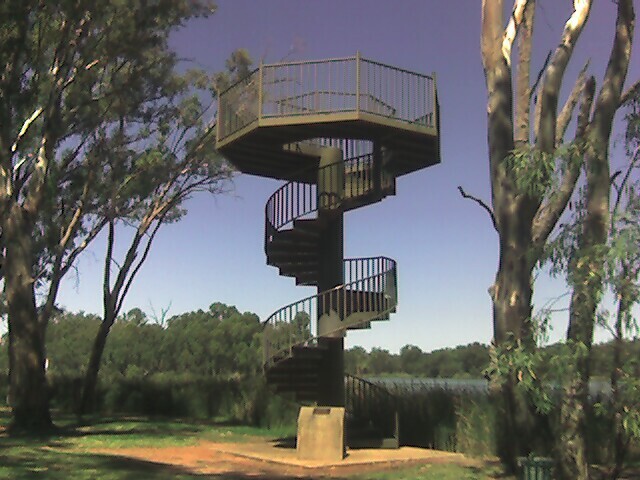 Much akin to the literate bushes is the remarkable stairway to nowhere. Much the same as every staircase I have encountered, it goes up and down (depending on your perspective). Unlike other staircases it appears that the primary purpose of going up is to come down. Very ingenious really. Much like a painted rock with "turn me over" on both sides, this staircase is sure to entertain blondes the world over. Further bush intelligence can be found (more readily than in America) in the amazing two dimensional rendition of the saviour of Wentworth from yonder year. I hear you saying, "Pardon?" Apparently the town was nearly destroyed in 1956 when the two rivers swelled due to a flood. The Fergies (a type of tractor) banded together and saved the town by building levies. According to the town clerk of the day, "By God and By Fergie we beat the flood." 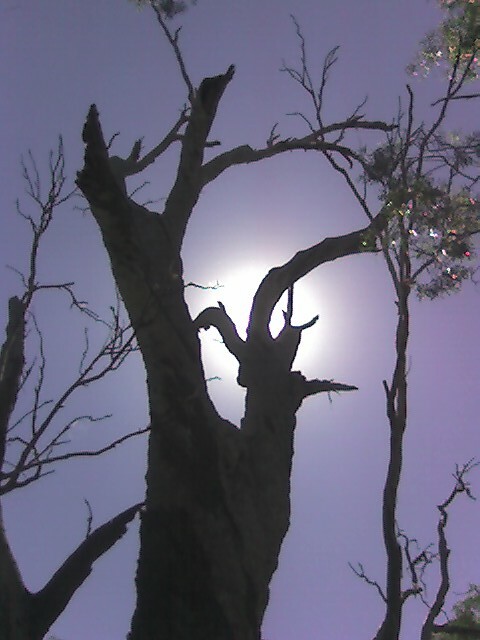 Half way down the walking track to nowhere (it starts just past the staircase of similar purpose) I found the perfect tree! See the halo? 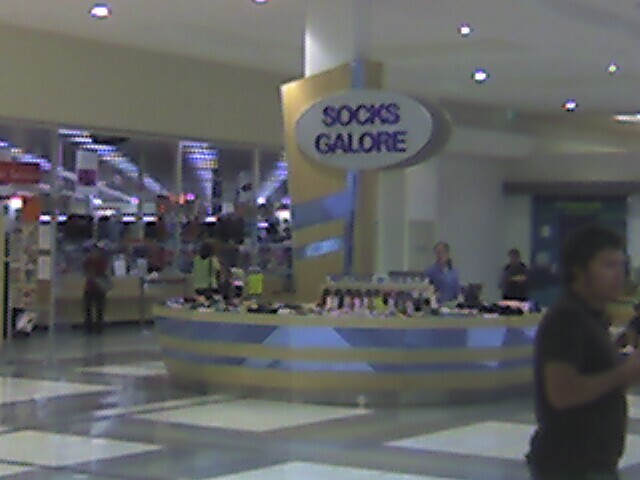 As I got closer I realised that they stocked and sold ... ONLY ... socks. 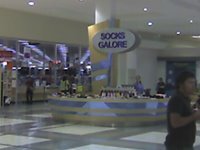 So, I walked up to the nice lady trapped in the circular booth and with a very serious expression asked, "Do you have any socks?" I maintained eye contact, making sure not to look down at the display filled with a multitude of the requested items. Her reply was understandable, "I'm sorry?" I repeated the quesiton of the day, "Do you have any? You know, socks." Then I smiled. And so did she. I then participated in a very vigorous discussion on the multiplicity of available socks and the types of people who buy them. "Some days I really love my job!" She said, "Some days I don't." I couldn't help but think that perhaps my silly question and my full attention for the ensuing five minutes caused today to be one of her good days at work. I don't think we talk to each other enough. I mean, just talk. About whatever. To strangers. Give it a shot. Ask the obvious and enjoy the results! Every once in a while I get an email from someone who has found my online bible studies for children. Here is one I received just today. It brought a smile to my face and warmth to my heart! I am in Kenya in the capital city of Nairobi. I was listening to The World's Technology Podcast on my way to work this morning and heard a Chinese guy use the best phrase. I mean, it was one of the greatest phrases of all time. I am going to integrate it into my vernacular immediately. He said: "It's just killing the chicken to scare the monkeys." I know what you are thinking. You are saying to yourself, "Self, we need this useful word picture in our vocabulary just like Dave. But, how can we use it?" Teachers - There are a group of kids running through the library. Grab the slowest one as he flurries past and give him a stern lecture and perhaps even a scare (like: "Run in the library again and it's your lunchtime gone tomorrow!") The example you made of this young man in front of his peers has just killed the chicken to scare the monkeys. Parents - On arriving home from work, just grab the nearest kid (preferably one of your own) and give a swift swat to the behind whilst stating loudly, "That's for the lot of ya! I know you've been up to no good!" You've just killed the chicken to scare the monkeys. Editors – umm… hmm… can’t think of an illustration for you. Just keep up the good work. So, anyway, there's a great phrase. And it calls to be used and abused. I've gotta go... There are monkeys to scare. A thumbs down for "sign here"
This morning I stopped on my way to work to get petrol. When the friendly shop assistant asked me to "sign here" after using my credit card I did so as I always do. I like to watch the "study" that takes place at this point. Some clerks glance at the two signatures. Some look closely. A couple weeks ago a Coles clerk looked like she was seriously doubting my authenticity. I don't think I could sign my signature the same way twice if I tried! Anyway, back to the station. The clerk lifts the signed receipt and the card and looks at both and then hands me my card back with a "that's fine." But here's the interesting bit... She looked at the face of the card to compare my name with my signature. She read the raised lettering "David Edgren" and then looked to see if my signature was the same name. Or, in a less favourable view of her intelect, she just knows she is supposed to hold both the card and the docket up for a moment before giving the card back. I nearly started laughing! My point is this... Signing is rediculous and outdated. I can use my Credit Card without a signature on the phone, internet and a fax. But, in person I have to scribble. Rediculous. Actually I think Credit Cards are outdated. Thumbs are all you need. Imagine this - you reach the teller and put your thumb on a finger print reader. Then the screen lights up with all the accounts available to you - depending on your bank accounts. You choose one and the clerk says, "Thanks Dave" because your name popped up on their screen too. That just makes more sense. And it is perfectly possible. Somebody should start "Thumbs Down Accounting Services" and charge .1% per use. They'd be rich and I'd be happy.